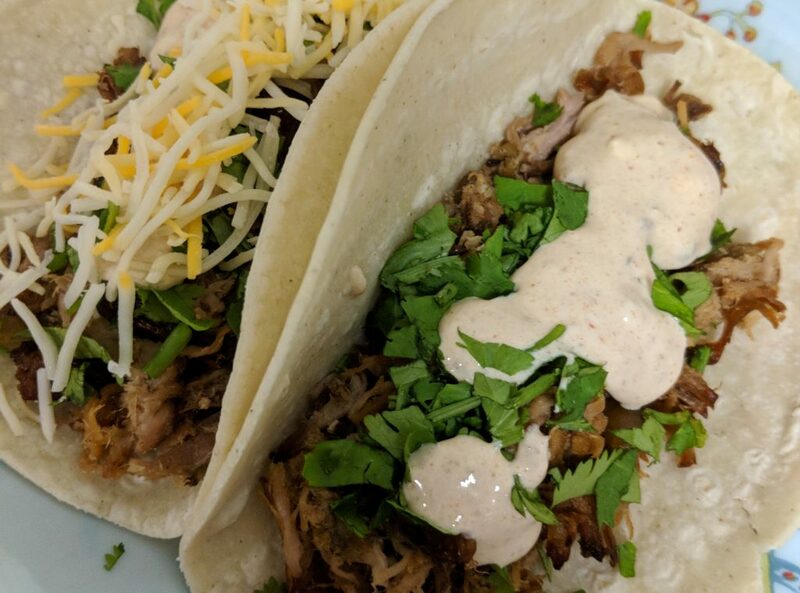 The carnitas were fantastic straight out of the slow cooker, but it was nothing compared to the finished product. After stealing several bites (it was so tender you could just pull pieces away! ), I took the shoulder out of the slow cooker and shredded it. With how large the shoulder was, it took a little bit. After the pork was shredded, I took what was left in the slow cooker and strained the juices into a bowl. 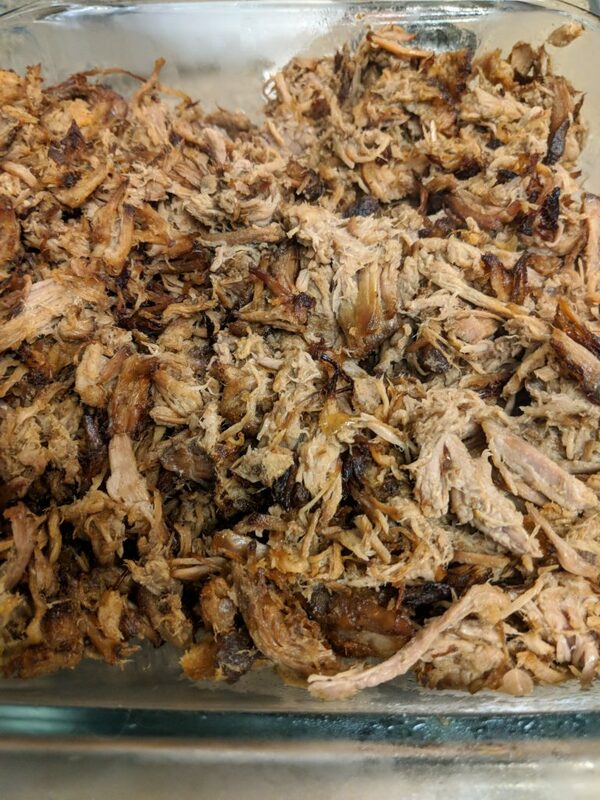 I broiled my pork in two batches, as I only had my smaller baking sheet available, and wanted the pieces spread thinly enough for all of them to get crisped up. Originally I broiled it for five minutes but found that it wasn’t very crispy yet, so I put it in for another three. Once the top was crispy, it got doused in a third cup of the juices, tossed, and put back in. After the second five-minute broil, I tossed it in another third cup of juices. The finished carnitas went into small flour tortillas. I was out of avocado, so I topped it with onions, cilantro, and a sour cream/hot salsa sauce mix. Our only salsa was a ghost pepper variety that we’d severely underestimated, so I hoped the sour cream would help mitigate some of the heat (it wasn’t enough). Looking back, I think I’ll serve them differently next time. 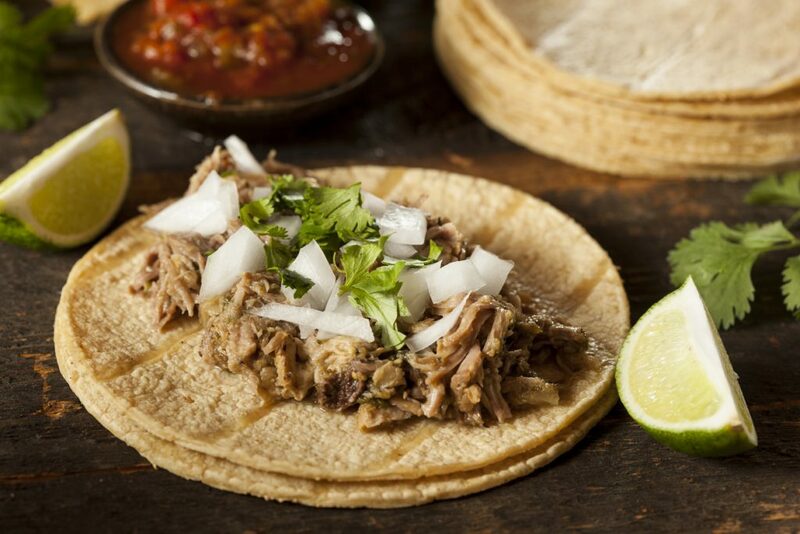 I would use a crunchy tostada instead of the flour tortillas, as that texture would work better with the meat. As for toppings, I think a creamy guacamole, cilantro, diced onions, fresh tomato, and sour cream would be the way to go. 1. Mix chili powder, cayenne, cumin, oregano, salt, and pepper. After trimming the fat off, rub the pork shoulder with the spices. 2. Heat bacon grease in a large pan. Over high heat, sear the shoulder on all sides until browned. 3. Add pork and remaining ingredients to slow cooker. Cook for 10 hours on low or 6 hours on high. 4. Remove pork from slow cooker, let excess fluids drip off. Strain the leftover juices into a bowl and set aside. 5. Shred the meat and spread the pieces evenly on a large baking sheet. Broil for 8 minutes. Remove the pork, pour 1/3 cup of the reserved juices over it, and toss. Broil for an additional 5 minutes. Pour another 1/3 cup of juices over the meat, toss again, and serve immediately. If extra crispiness is desired, broil for another 5 minutes. You can eat the carnitas by themselves, like pork BBQ, or you can serve them on tostadas with guacamole, sour cream, onion, and fresh tomato. Either way, you’ll likely want some cerveza to go with them!